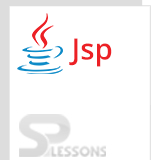 The JSP Standard Actions are used within the JSP page and are used to eliminate or remove scriptlet code in a JSP page because now-a-days, scriptlet tag is not recommended. The programmers consider these has a bad practice to put the Java code in the JSP page. The standard tags are as follows. The jsp: forward activity tag is utilized to forward the solicitation starting with one asset then onto the next resource.The different assets are JSP, HTML. JSP Standard Actions – Following is an example. Here the developer just forward tag for the page printdata.jsp . When compile the code from the index.jsp page printdata.jsp page text will be displayed. Now compile the code from index.jsp file, result will be as follows. Here forward tag used on display.jsp page, parameters are passing here. The request.getParameter() is used to retrieve the parameters. The jsp:include tag are used to include the content of the other resource like jsp, html, servlet, The include action tag are process or include the content at the request time, so jsp:included tag is utilized for element pages since it may change in future. Reusability of a code is an advantgae with include tag. At interpretation time it incorporates different assets. At solicitation time it incorporate different assets. It better to use static pages. It better to use dynamic pages. Here printdata.jsp page has been included. The parameters have passed here. action tag redirect the servlet Request and Servlet Response to another resource specified in the tag. The path of the resource is ‘relative path’. The output generated by current JSP will be discarded. action tag process the resource as part of the current jsp. It include the output generated by resource, which is specified in the Tag to the current JSP. In both the cases single Request process multiple resources. JSP Standard Actions – Forward tag is used to forward the request and response to other resources.